Banditos' new album Visionland is coming June 23rd, 2017. 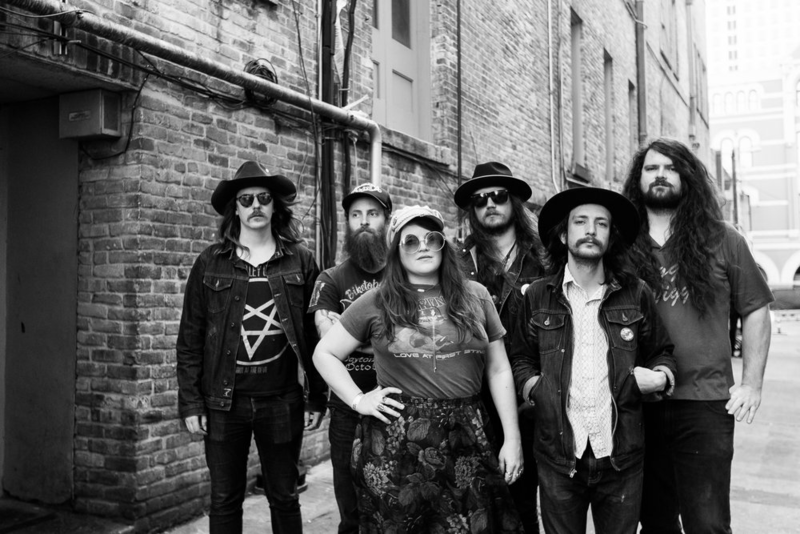 Produced by Israel Nash and Ted Young, the Birmingham/Nashville-based group’s second full-length has one foot firmly planted in reality as the other tip-toes in and out of mental complexities, self-perception and altered-state illusions. The results are revealing, exhilarating and profound. After spending much of the last two years on the road, relentlessly showcasing their critically acclaimed 2015 self-titled debut album, the six bandmates of Banditos regrouped in late 2016 at Plum Creek Sound Studios and democratically poured out sonic influences and emotionally charged personal experiences for their new album Visionland. The album-titled track reveals these defining, cohesive thematic intricacies. “Visionland” is named after the defunct $60 million theme park that was built in the late ‘90s near some of the band members’ childhood homes in Bessemer, Alabama. The park was shut down after only five years and the schizophrenic glimmer of hope it offered local residents connects to a greater overlying optimism for life present at the album’s core, an eerily relevant theme in contemporary complex times. Jeff Salter’s sweeping guitar strums swell at the song’s intro, lifting through the murky haze into the warm and sunny clarity of a duet between singer Mary Beth Richardson and singer/guitarist Corey Parsons. There is a shared mindset throughout; a persevering glint of what could be, a distorted possibility, struck by a frigid gust of reality. Like some sort of modern day, Southern-born The Band, some songs were written over years by a single member (the surfy jam “Lonely Boy,” which was written by singer/guitarist Parsons in response to being tour weary), others by a combination of the players (the punk-garage soul, Stooges-meets-Velvet Underground churner “Fine Fine Day” was penned when Parsons and Pierce drank massive amounts of vodka one day in Opelika, Alabama) and the dynamics show for it. There's a phantasm of vintage ‘60s Etta James soul (plus burning-hot background singers) on “Healin’ Slow” and, later, the hopping country blues of “DDT." Topics and styles range this way on Visionland - the heavy and emotional to the light and simplistic - but the Banditos always sound like themselves and always drive the nail deep into the groove.